A satirical and thought-provoking musical history of disability in the 20th Century with shifts in mood and attitude from the Great War, the Nazi era, the post war boom and up until the present day. "there's a bloodcurdling derring-do about 20/20 that exposes the solipsistic, blinkered blandness of most British dance theatre, I only wish I had discovered Amici years ago." 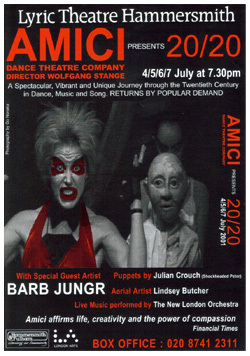 "a powerful show that confronts our attitudes to the war damaged and the disabled, a wholly intenetional 'freak' show created by Wolfgang Stange"
"Stange has a genius for directing such simple yet powerful effects"
"If you believe that in making art we can help improve the world around us, look at Amici."